Alliance Pipeline's 80-mile, 12-inch Tioga Lateral pipeline came into service in September and is moving Bakken gas onto the Alliance mainline. The pipeline was constructed over a period of a little less than a year at a cost of $170 million. The pipeline adds much needed high btu, wet gas pipeline capacity out of the basin. The lateral has capacity to move ~126 mmcfd from Hess' Tioga Processing Plant to the company's mainline system near the Canadian border. The system was originally supported by an agreement with Hess to move 61.5 mmcfd for ten years. The Alliance system has capacity to move 1.6 Bcf/d of high btu gas out of Western Canada to Chicago. 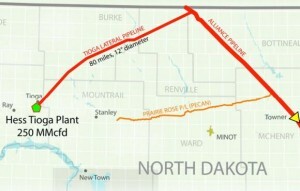 The Tioga lateral is the second pipeline from the Bakken that ties into the system. As much as ~250 mmcfd can now move into the system through the Tioga Lateral and Pecan Rose Pipeline.